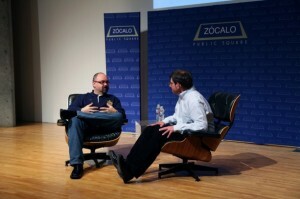 Curious readers got a glimpse behind the art of creating literature when Carlos Ruiz Zafón visited MOCA for a Zócalo Public Square event on May 24. Zafón, who splits his time between Barcelona and Los Angeles, is the author of the New York Times bestselling The Shadow of the Wind, the recently published The Angel’s Game, as well as four young adult novels. His work has been translated in 40 languages. Zafón’s novels are infused with lyricism and mystery and explore beauty found in light and shadow. He builds labyrinthine plots like an architect of words, develops characters and landscapes with a cinematic eye, and draws you into a magical world beyond paper and ink. While his books make that process look easy, this literary maestro humbly revealed himself at the Zócalo event as, not a magician, but a craftsman who has to work hard.